Preheat your oven to 400. Prepare a muffin tin with liners. Get a small bowl, a large bowl, and a small measuring cup. In the small bowl, mix together first 5 ingredients and set aside. In the large bowl, combine the next two ingredients-- the Coconut Milk and vinegar. When it sits for a couple of minutes, it creates vegan "buttermilk". In the measuring cup, prepare your flax "egg" by stirring together the flaxmeal and warm water. Let that sit, it will congeal and the consistency will become egg-like. Next, add the oil, sugar, vanilla, and ripe bananas to your large bowl. Using an immersion blender, blend all ingredients until smooth. THIS NEXT PART IS IMPORTANT. 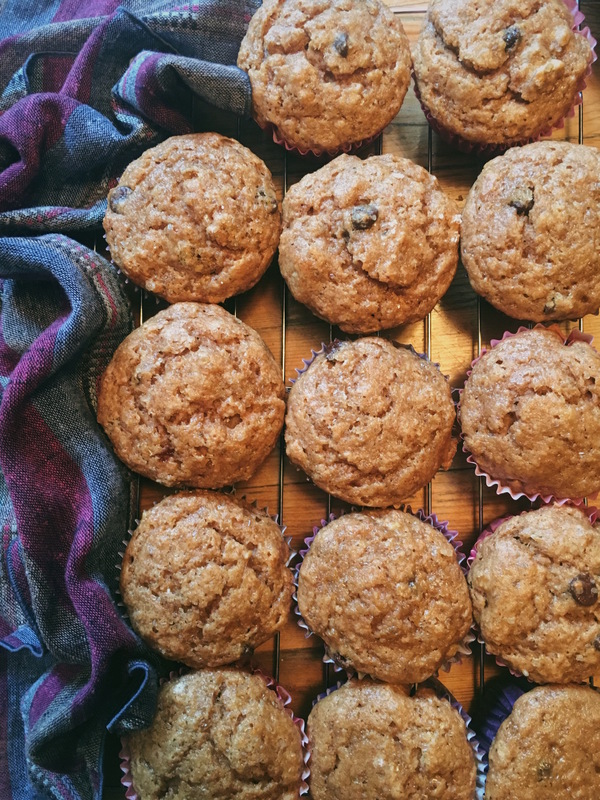 The key to fluffy muffins is to not overwork the gluten-- meaning don't mix too much. Otherwise you'll get dense, hard muffins. And that blows. Using only 10 strokes with a rubber spatula (so you can incorporate everything that sticks to the side of the bowl), combine the dry ingredients with the wet ingredients in the large bowl. Last, use only 10 more strokes to fold in the chocolate chips and walnuts. Little flour streaks in your batter are okay-- it all works out in the end. Fill each muffin liner to the top. Bake for 5 minutes at 400 (this makes 'em RISE), then 12-13 at 350. Let the muffins cool on cooling racks for at least 10-15 minutes. Enjoy!